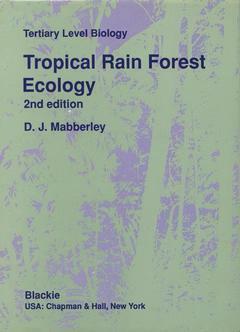 Tropical rain forest ecology (2nd ed.91) bound Mabberley D. J. Add to cart the livre of Mabberley D. J. Since the first edition of this book was written, public awareness of tropical rain forests has become so great that issues involving their exploitation are the stuff of daily newspapers, radio and television. The plight offorest-living peoples has become an international issue; concerns over the greenhouse effect and other climatic changes are often linked to rain forest destruction. At the same time, there has been an unparalleled scientific interest in the workings ofthe rain forest and an increasing concern by economists as to its potential in balancing the books of many developing countries. The need for an advanced yet concise and up-to-date synthesis of recent studies and a key to the increasingly voluminous literature on rain forests is even greater than it was in 1983. There are now many highly illustrated popular books on rain forests, as well as new editions of K.A. Longman and J. Jenik Tropical rain forest and its environment (2nd edition, 1987) and T.e. Whitmore Tropical rainforests of the Far East (2nd edition, 1984, many of the splendid illustrations from Introduction to tropical which are to be found in his rather less ambitious rain forests, 1990). Other very welcome regional accounts of rain forest biology in various parts of the tropics have appeared, notable being D.H. Janzen (ed. ), Costa Rican natural history (1983); Earl of Cranbrook (ed. ), Malaysia (1988); G.T. Prance and T.E. Lovejoy (eds), Amazonia (1984); A. 1 The Tropical Rain Forest.- 2 The Changing Physical Setting.- 3 Soils and Nutrients.- 4 The Changing Biological Framework.- 5 The Components of Diversity and Their Dynamics.- 6 Coexistence and Coevolution.- 7 Species Richness.- 8 Traditional Rain-Forest Use.- 9 The Changing Forest Today.- Postscript.- Further Reading.- References.